Before my move to Vancouver in 2007, my friends took me to the Body Blitz women’s spa in Toronto, on Adelaide, between Bathurst and Spadina. I loved it so much, when I moved back, I used getting married as an excuse to get a bunch girls together for the chance to relax before the big day. Since then, I’ve been back twice, in November, and on New Year’s Eve. Body Blitz is a spa for women only. Based on traditional European models, they have 3 different temperature bath waters, massages by Registered Massage Therapists, and scrubs and body bakes as well. With each treatment you can use the waters for free, but you can just go to use the waters themselves. In September, because some of the girls only did the waters, I had my massage first and then entered the waters to hang out with everyone as they arrived. In November, my friend and I went, and we did the waters before having massages, as they recommend. It’s definitely better doing it that way. On New Year’s Eve (morning) I took my friend to just use the waters. We had such a fabulous time, just enjoying the dead sea salt pool, the aromatherapy steam room, the infrared sauna and the green tea hot pool. We ordered their antioxidant smoothie, which was perfect once we’d gone through the steam room. The cold water plunge isn’t my favorite part, but it tightens the pores, so I didn’t complain too much. It wasn’t too busy considering New Year’s Eve fell on a Saturday, which is one of their busiest days of the week. Body Blitz is opening up a second location, which is a very smart move for them. When we had our pre-wedding gathering, it was so busy, my friends and I had to share the recliners between water uses. They have discounted water use on Tuesdays, but they and weekends are usually extremely busy, so if you haven’t booked a treatment, you might have to wait for the waters. It will also feel crowded once you’re in. This makes the hot tea pool feel small for the number or women who want to use it. If you’re going in a group just to use the waters, a fantastic option is the The Therapeutic Waters Card: 6 waters for the price of 5. If you have 6 girls going for the waters, you can split the difference between you, which makes it easier to justify an extra antioxidant smoothie. Head over on a weekday if you can, and enjoy the waters! OMG! This sounds heavenly. I’ve never been to a spa myself but hopefully one day…. It was wonderful. If you can find an equally fabulous place near you, I highly recommend going with a gal pal. 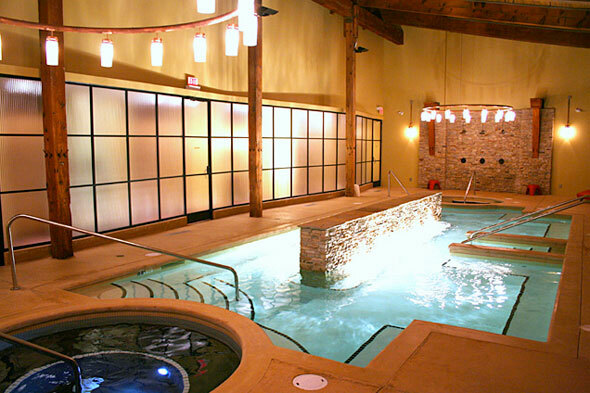 There are also places like the Scandinave Spa in Blue Mountain, or in Quebec, that are for both men and women. It make for an absolutely wonderful date.